At last spring is here…. After the spell of colder weather in February, the days are now starting to get longer and hopefully milder. The spring equinox in March, when the day is the same length as the night, takes place on the 18th of the month, and from then on – hurray – we are into longer drawn-out days. By the end of the month the hours of daylight will have increased by a whole two hours and will stand at 13 hours! When the clocks go forward on 29th March it starts to feel like spring is properly underway. For market visitors, the month can seem like something of a lean one as we have to wait for the benefits of kinder weather conditions for animals and crops which will respond to the increasing light and warmth with bounty to come. That’s why March is traditionally known as the hunger gap or famine month. 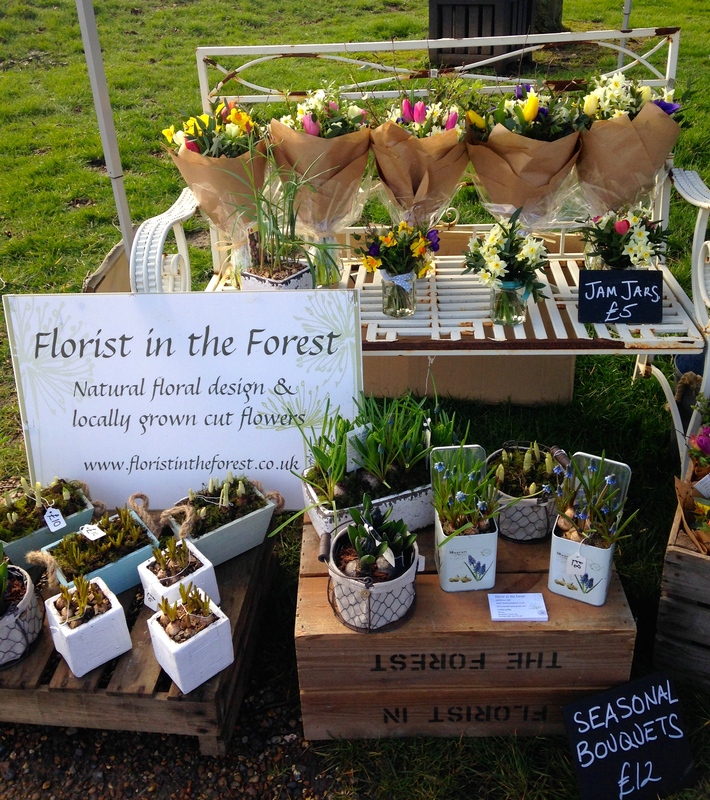 But it’s really a great opportunity to make most of the last of the winter at the Farmers’ Market this month, and savour all those wonderful comfort foods and warming treats before they disappear again till the last quarter of the year. After all, that’s one of the real joys of seasonal local shopping – life moves on, ingredients come and go with the changing year, and we can all enjoy knowing we are eating food at its finest whilst giving vital support to local producers who are working flat out to bring us their finest. And there are some lovely treats starting to arrive to remind us of the new season ahead. For meat eaters, pork is an excellent choice this month and it’s still ideal weather to enjoy a hearty roast on Sunday with all the family, after a muddy walk enjoying the spring flowers and increasing bird song as mating and nest building gets under way. Try a shoulder joint for the best combination of flavour and texture. The cheaper cuts are worth trying in slow cooked stews – pig’s cheeks and pork belly, breast of lamb, shin of beef – all great value and superb eating when the weather is still holding onto winter. 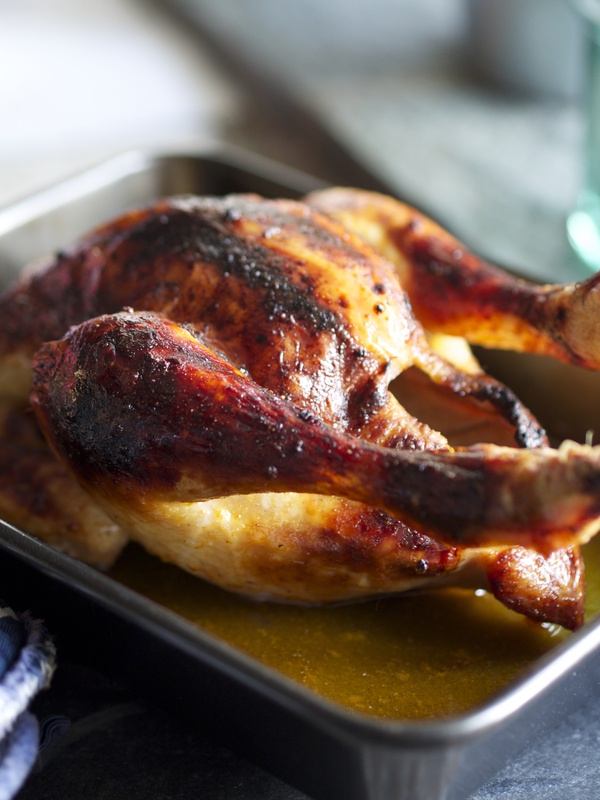 Or what about that eternal family favourite – a roast chicken? Try the recipe below for a version cooked with local beer that goes really well with roast wedges of sweet potato tossed in cold pressed rapeseed oil and a sprinkling of ground ginger before cooking. Serve with purple sprouting broccoli. Rough shooting takes over as the end of the season has arrived for many game birds so rabbit and wood pigeon are both good eating now. And if you haven’t had venison this winter, try some now maybe in burgers or sausages served with steamed kale and mashed root veg, or make the most of the game mixes that many dealers sell to use up the season’s bits and pieces for pie, braises and stews. Look out for locally made excellent game pies and pasties (and other meat or veggie fillings) on sale at many markets – made with local produce, they take the hard work out of enjoying a really good pie. Put a few in the freezer to enjoy later in the year at picnics. For fish lovers, sea bass is excellent this month – I bake it whole with shredded fresh ginger and leeks and a dash of sesame oil – or try a wonderful warming fish stew as a superb way of enjoying superb local fish and seafood. Use a combination of cod, mussels and clams in a risotto or soup. Or spoil yourself a little with wonderful local lobsters and native oysters, clams, cockles and mussels. Storms permitting, Kent and Sussex scallops are at their finest now so enjoy one of the great pleasures of the season. Sardines are good now with the cold waters around the coast producing sparkling fresh fish with bright eyes and firm flesh. Salmon is also a good choice in March and many markets offer good local smoked and cures that make a lovely light lunch dish or starter for a special meal. Cabbages, cauliflower, purple sprouting broccoli, leeks and kale are all good in March. They need little cooking and are really at their best simply shredded and steamed. Or try quickly stir-fried with garlic, ginger and chilli for an accompaniment to good local sausages. Cauliflower goes really well with curry spices so try it in vegetable curries, soups and fritters or in a puree as a base for scallops grilled with cubes of black pudding. And make the most of leeks, carrots, swede and Jerusalem artichokes before they disappear. Beautiful pink forced rhubarb is really the only local fruit around now but the season for the fine ‘champagne’ season is short so make the most of it. Use in fools, ice creams and sauces – it goes particularly well with a large pinch or two of ginger. Or make up batches of rhubarb compote and freeze in pots for later in the year. And don’t forget it makes wonderful cakes – crumble topped, or upside down, with almonds or ginger. Serve as a pud with ice cream or keep for the tea tray. Don’t forget that local apples are still good as the storing varieties go on delivering flavour and texture until April. Finally stock up the jams, jellies and chutneys using this winter’s produce to keep you going over the next few months – you will find old favourite flavours such as rhubarb and ginger and quince, with many hedgerow jams and jellies and many more unusual offerings to tempt you into buying. Why not try a locally baked cake or sweet tart this month when the range of seasonal fruit is limited. Cold weather, the arriving spring, the first daffodil – they all make a great excuse to celebrate with local produce, if you really need one! A good read this month! And if you want to find out a bit more about the beginnings of the farmers’ market movement, look back at the foods of your childhood or maybe try some fascinating vintage recipes that everyone will enjoy today, then look out for my two new books arriving in book stores and available online this month. This coming year (2105) is the hundredth anniversary of the setting up of The Women’s Institute. And I was commissioned to write their centenary cookbook, The WI Cookery Book: The First 100 Years due out on March 5th. It’s not just any cookery book either but a social commentary told through the medium of 100 emblematic recipes that each sheds a fascinating light on the period, providing a fresh way of examining the role of women at the time. The second, Back In Time for Dinner supports a new BBC 2 series of the same name, produced by Wall to Wall, who also make Who Do You Think You Are? for the BBC amongst other programmes, the series (which is on air in March, first episode Monday March 16th BBC2) follows one modern 21st century family from east London (and their kitchen! ), as, thanks to the magic of television, they travel across half a century of family dining from 1950 to 2000, guided through by Giles Coren and food historian Polly Russell. In the process they discover how family life and eating have changed almost beyond recognition over that period. I myself had fun being a guest at a 1970’s dinner party filmed for the 70s episode, airing on Monday 30th March (admittedly I would have been only 13 in the year the party is meant to have taken place!) but oh, the orange flowery wallpaper, lava lamp and dodgy white wine brought back memories, and mostly good ones! The alcohol cooks out leaving a tender richly-flavoured bird..
Place the chicken in a shallow dish. Mix together the oil, garlic, honey, paprika, vinegar and seasoning with 3 tbsp of the beer. Pour over the chicken and rub into the skin. Cover and leave to marinate for 30 minutes. Preheat the oven to 180C Gas Mark 4. Transfer the chicken to a roasting tin, pour the beer around it and cook for 1 – 1 1/4 hour, basting regularly until the chicken juices run clear when a thigh is pierced with a skewer. Leave to rest for 5 minutes then carve and serve with the pan juices, roast potatoes and steamed broccoli. This entry was posted in Farmers Market, In season, Kent, Local food and tagged Back in Time for Dinner, beer roast chicken, chicken recipes, farmers markets, Hepworths, in season, Kent farmers markets, local food, march seasonal food, Penshurst farmers market, Quick recipes, seasonal food, The WI cookbook: The first 100 years, Wall to Wall. Bookmark the permalink.